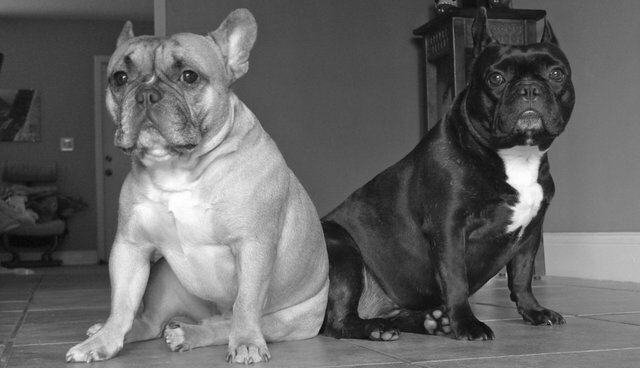 A pair of French bulldogs who went missing after a home robbery earlier this week has been reunited with their owners. Rue, an 18-month-old deaf bulldog, and Pierre, who is two, were found wandering by themselves in a park two-and-a-half miles from their home, when a man who had seen flyers about them noticed the missing dogs. He brought them to his home and cared for them just before a snowstorm hit, then contacted their owners, David Wilk and Charlie Gurion. The dogs had been gone since mid-morning on Tuesday, when an unknown burglar broke into the home Wilk and Gurion share with their friend, Josh Crews. It's unclear if the dogs were stolen in the robbery or if they merely escaped, but either way it seems they were glad to return home. "When [the dogs] came in the door, they were so happy to be home that they went bonkers crazy," Crews told the Chicago Tribune. "We offered [the man who rescued them] a reward but he refused it." The robbers stole a number of the men's electronics, including laptops, iPads, and a security system. Wilk told NBC Chicago that everything that had been stolen was "little stuff" -- except for the dogs. He and Gurion were "devastated" when they found that Rue and Pierre had gone missing. "These are our kids," he said. "It's too much to handle. I feel like we've lost our children right now." Needless to say, the couple has reported that they're thrilled to be reunited with their dogs.